In this post, an update on the budget, a look at how Harris County squares up health-wise, and the status of a few bills. Last Wednesday, the Texas Senate passed CSSB 1, the budget bill, on a vote of 29-2. The only “no” votes were newly elected Senator Sylvia Garcia and Senator Wendy Davis, largely due to the fact that the Senate version restored only $1.4 billion of the $5.4 billion cut from public schools last session. On Thursday, the House Appropriations Committee substituted the bill with its own version and voted it out unanimously. There are not significant funding differences for mental health and substance abuse services between the two bills, but one issue of note is that the House version added $2.5 billion for public education–over $1 billion more than did the Senate. In the recently released 2013 County Health Rankings and Road Map, a joint project of the Robert Woods Johnson Foundation and University of Wisconsin Population Health Institute, Harris County ranked 70th among 232 counties. This is down from a rank of 53 last year. Williamson County was ranked first, and Polk County was ranked last. The rankings take a variety of health factors into consideration, including poor health and mental health days, excessive drinking, physical activity, and the rate of uninsured. For a complete look at the rankings, click here. Relating to allowing certain minors convicted of certain alcohol offenses to perform community service instead of attending an alcohol awareness program. Relating to the health professions resource center. Relating to federal firearm reporting for a person who voluntarily identifies as a person with mental illness. Relating to the creation of a mental health jail diversion pilot program. In particular, I want to call attention to HB 1872, which would require the Department of Public Safety (DPS) to include in the information it reports to the Federal Background Check System a person who voluntarily identifies himself or herself to DPS or local law enforcement as a person with mental illness who should be precluded from purchasing a gun. MHA and several other advocacy organizations oppose this legislation because it unfairly and discriminatorily singles out people with mental illness. While there may indeed be people with mental illness who would voluntarily place themselves on this list, there are likely just as many people without mental illness who would do the same. In my view, this legislation unnecessarily stigmatizes an entire group of people. Thankfully, the good folks at MHA Texas are working on a floor amendment that would strike the reference to mental illness in the bill. If it comes up for a vote on the Floor, look for an advocacy alert on that amendment, and please be sure to contact your representative and show them your support! In this issue, get more detailed information on the mental health and substance abuse services funded by the House and Senate budget bills, information on how sequestration will affect behavioral health, and as always, a bill update. 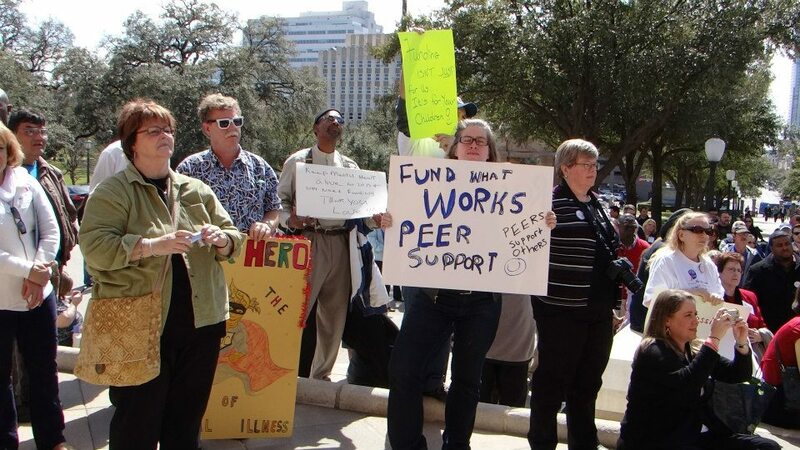 Additionally, Representatives Sylvester Turner and Ruth Jones McClendon submitted a rider to the budget that would ensure that increased mental health funding would address inequities among LMHAs. If maintained in the final version of the bill, this would mean that Harris County MHMRA, which has one of the lowest per capita funding rates among the LMHAs, would receive a disproportionate amount of the additional monies. The House Appropriations Committee also adopted the performance-based incentive plan rider adopted by Senate Finance. Regarding funding for behavioral health services, so far, so good! If you didn’t get a chance to respond to the MHA alert sent out yesterday, how about take a moment to call your favorite members of House Appropriations and Senate Finance to thank them for their good work? While the budget is looking good at the state level, things are shaky at the federal level. As a result of sequestration–the automatic federal budget cuts that are kicking in due to lack of Congressional action on deficit reduction–the U.S. Substance Abuse and Mental Health Services Administration (SAMHSA) is set to lose $168 million, or about 5%, of its total funding by September 30th of this year. This will include across-the-board cuts to all programs, including the mental health block grant (funded at a level of $460 million) and the substance abuse block grant (funded at a level of $1.8 billion). As a result, funding will be reduced accordingly at the state level. According to DSHS, funding for substance abuse services will need to be reduced by $6.7 million and funding for mental health services by $1.7 million. DSHS has asked stakeholders to complete a survey to give input on how DSHS should implement these cuts. Obviously, substance abuse programs will take a bigger hit, so it’s important to try and minimize the impact to the most important programs. For whatever my 2 cents is worth, I probably would recommend that funding for children’s substance abuse prevention, intervention and treatment services remain unharmed. If the adults take cuts, it may be better to target those to prevention and intervention, rather than treatment, since we still have a substance abuse treatment waiting list (at least in the current fiscal year). Again, that’s just what I think. If the substance abuse community has any thoughts, please share! That being said, please take a moment to complete this survey. It is due this Friday, March 22nd. Relating to the assessment of an elderly or disabled person’s psychological status for purposes of an emergency order authorizing protective services. Relating to the detention and transportation of a person with a mental illness. Relating to integrating behavioral health and physical health services provided under the Medicaid program using managed care organizations. Relating to the protection and care of persons who are elderly or disabled or who are children. Relating to tracking career information for graduates of Texas medical schools. Relating to a notification requirement if a school counselor is not assigned to a public school campus. Relating to specialty court programs in this state. Relating to criminal history record checks for certain employees of facilities licensed by the Department of State Health Services. Relating to the Children’s Policy Council, including the composition of the council. Relating to a housing plan developed and certain housing information collected and reported by the Texas Department of Housing and Community Affairs. Relating to the creation of a mental health and substance abuse public reporting system. Relating to a home visiting program for at-risk families. Again, check out summaries of these bills, MHA’s positions, and more by viewing our bill tracker. State and Local Updates….Part 3? I’ll include more specific details as they become available, likely in next week’s blog post. But it looks like that Advocacy Alert I’ve talked about to thank members of the Senate Finance Article II Workgroup and other Senate Finance members will need to include the House Appropriations Article II Subcommittee and other committee members. Stay on the look out for that. It’s looking like it’s going to be a great session for behavioral health! Now, really, until next week! Well, I don’t have any more local updates (at least that I can share…yet! ), but I’ve got some more budget news and the much-awaited bill tracker! While the House still needs to come a long way in increasing funding for mental health and substance abuse community services, it is good to know that these issues are still being addressed in other areas of the budget! Bills, Bills Coming Out of My Ears! Well, a few folks have been asking for the updated bill chart, and you can find it here in all of its glory! March 8th was the bill filing deadline, and almost 2,600 bills–or about 44% of total bills–were filed last week! That made for a long weekend and is at least partially responsible for the delay in getting this out for public consumption. But, I’m sure you’ll all forgive me! HB 2887 by Davis, which requires DSHS to make Haven for Hope-like grants to local entities to coordinate services for homeless individuals, people with mental illness, and people with substance use disorders. SB 1477 by Deuell, which requires HHSC to negotiate with the United States Secretary of Health and Human Services for flexibility in the Texas Medicaid program and in obtaining a block grant to cover the Medicaid expansion population under the ACA through premium assistance for the purchase of private health insurance coverage. Remember, you can track all these bills, read their text and find out MHA’s position on them by using our trusty bill chart! In Part 1 of this post, learn about state discussions on Medicaid, local goings on with the Felony Mental Health Court, and what happens When a Mind Changes. It is clear to any Capitol observer that Medicaid is on the forefront of the minds of Texas legislators, both Republicans and Democrats. To make sure it stays there, approximately 2,000 people gathered at the Capitol last Tuesday to show support for Medicaid expansion as laid out under the Affordable Care Act (ACA). For a summary of the rally, check out the post by Peter McGraw of the Hogg Foundation for Mental Health. On Friday, the House Appropriations Committee heard testimony from experts and elected officials on Medicaid expansion. Health and Human Services Commissioner Kyle Janek made a presentation outlining what the expansion would look like in Texas. Along with other provisions of the ACA, the Medicaid expansion would cut the current uninsured rate in half. In addition to the Legislative Budget Board’s earlier estimate that $50 million of state general revenue could draw down $4 billion of federal money in the next biennium, former chief revenue estimator Billy Hamilton stated that the expansion could free up an additional $1.2 billion of general revenue next biennium. Our very own Judge Ed Emmett also testified, sharing that Medicaid expansion has the potential to bring $975 million a year to Harris County. He reminded legislators that “poor people are going to continue to get sick and they’re going to continue to get care,” but the main issue is going to be who pays for it. Currently, local taxpayers are largely footing that bill. He also urged them to recognize the immediate pay off of Medicaid expansion, while also cautioning “that it’s not just about dollars, it’s also about human potential.” Well said, Judge! Medicaid expansion holds significant potential for people with mental health and substance use disorders. The PCG Report estimated that 90% of current non-Medicaid eligible individuals receiving publicly funded mental health and substance abuse services would qualify if eligibility was expanded. There’s no doubt that legislators will continue to weigh all options related to this matter, including a “Texas solution” that grants flexibility in the use of Medicaid dollars, potentially steering people into private health plans. We’ll continue to monitor this throughout this session and beyond! Last week, the Harris County Felony Mental Health Court held a stakeholders meeting to give updates on the court since it started operating over a year ago. Obviously, the court has seen a few major changes over the past few months, including two new judges. Judges David Mendoza and Brock Thomas will run two dockets for individuals with mental illness and individuals with co-occurring mental health and substance use disorders, respectively. Since its inception, the Court has received 159 referrals, with 64 current clients. Over the past six years, these clients have cumulatively spent over 15,000 days in jail, incurring a cost of close to $900,000 in jail time alone. No doubt, the mental health court has the potential to help these folks maintain their treatment and break the cycle of incarceration. Individualizing sanctions for court infractions, while using jail as a penalty as a last resort. Over all, the Court’s first year of operation was considered a great success. The mental health community should continue to support the court and advocate for expansion opportunities whenever and wherever they arise. I am so very proud of a new MHA publication, “When a Mind Changes: Personal Stories About Mental Illness and Its Effect on Individuals, Families and Communities.” This booklet, which includes forewords by Harris County Judge Ed Emmett and Houston Mayor Annise Parker, tells real stories about real people in the Greater Houston area. The stories of mental illness are as varied as we are. Take Elizabeth McIngvale, a young girl ravaged by a severe case of Obsessive Compulsive Disorder before she even turned 13. Or Dr. James McSwain, Principal of Lamar High School, who actually allowed his son to remain in the Harris County Jail so he could receive needed mental health treatment. Or Brenda Bouie, who lived in Hermann Park for 17 years, largely due to her battle with Schizophrenia. Their words are powerful; their courage is inestimable. You’ll recognize fears, hopes, and dreams that you or someone you know may be dealing with right now. I encourage you to get to know the people and the issues in this booklet. We hope it will promote a better understanding of mental illness and the need for services among the general public and, in particular, our elected officials. If you would like hard copies of this booklet, please contact Traci Patterson at tpatterson@mhahouston.org. That’s all for today. Stay tuned for more budget updates and bills tomorrow! In this post, learn about Capitol Day, the budget, and bills! On February 28th, hundreds of mental health consumers, family members, providers and other advocates descended on the Capitol to send legislators a clear message that mental health must be a priority this session. 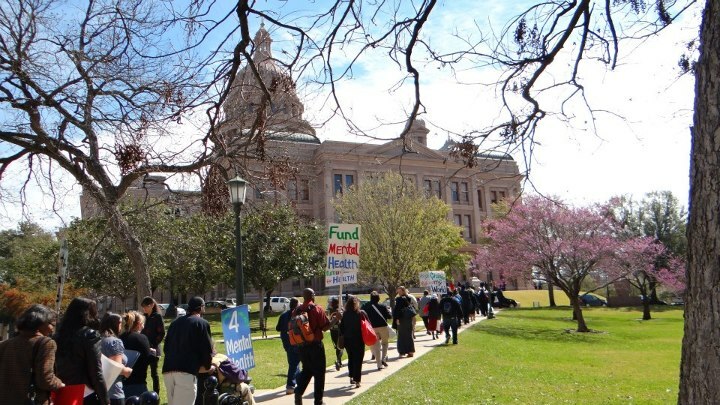 MHA worked with NAMI of Greater Houston and St. Joseph’s House to send 2 busloads of advocates to the Capitol. Houston area advocates received advocacy trainings on the bus from MHA staff and volunteers, and received additional training materials from statewide advocacy groups in Austin. 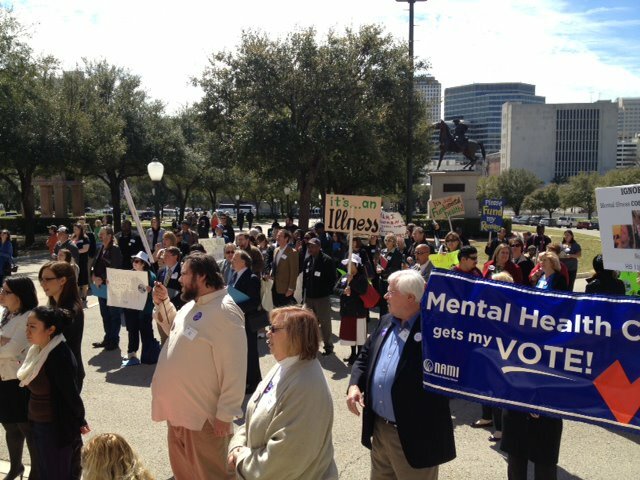 Before commencing with Capitol visits, all mental health advocates participated in a (positively) raucous rally that included addresses from a number of legislators, including Harris County members Sen. John Whitmire, Rep. Debbie Riddle, and Rep. Gene Wu. Advocates across the state met with a majority of the members of the Legislature to advocate for increased funding for mental health and other legislative initiatives. Of course, ALL of the participants are special, but I want to take the opportunity for a few shout-outs. I want to thank MHA’s two Betsy Schwartz Interns–Yvonne Mendoza and Lisa Richardson–for their help in making Capitol Day a success. Yvonne conducted one of the legislative trainings on the bus, and both interns made legislative visits. The contingent from St. Joseph’s House also made quite the impression on legislative staff with their heartfelt accounts of living with mental illness. A Chief of Staff for one of the members of the House Appropriations Article II Subcommittee commented on how courageous the group was and the importance of putting a face on mental illness. Kudos to Grant Kennedy and Laurie Hallmark for making that possible! Finally, I want to thank mental health advocate and philanthropist Maureen Hackett for making several legislative visits that morning with MHA CEO Susan Fordice. Mrs. Hackett, along with her husband, Jim, also visited with Governor Perry’s Deputy Chief of Staff and Chief Budget staff person regarding the importance of funding mental health services. All in all, it was a FABULOUS day at the Capitol. But this is just the beginning. For everyone who attended–and even for those who did not–we’ve got to keep making our voices heard! I think it would be a good idea to thank the members of the Senate Finance Article II Workgroup for their prioritization of these funds. MHA will be sending out an action alert asking members to do just that. The House Appropriations Committee is meeting today to hear recommendations from the House Appropriations Article II Subcommittee. From discussions with members of the subcommittee, the House’s mental health and substance abuse recommendations fund just a few of the exceptional items partially, leaving much left to be desired. However, the good news is, nothing is final until May, any many observers, including those in the Governor’s Office, feel that the House will eventually come around. I will keep you posted on House deliberations in this area! Congratulations are in order for former Harris County Commissioner Sylvia Garcia! In the special election held this past Saturday to fill Senate District 6, the seat of the late senator Mario Gallegos, Sylvia Garcia garnered 53% of the vote to defeat Rep. Carol Alvarado and become the newest Texas State Senator from Harris County. Sen. Elect Garcia was a firm supporter of mental health and substance abuse issues during her tenure on Harris County Commissioners Court, and I have no doubt she will continue to do so in the Texas Senate. MHA looks forward to working with her to move important behavioral health legislation forward this session! For a more in-depth look at mental health and substance abuse legislation and to see MHA Houston’s position on these bills, click here. As always, stay tuned for more relevant updates! Enter your email address to follow, "MINDING HOUSTON," and receive notifications of new posts by email.